The electric acoustic stimulation (EAS) system combines the technology of cochlear implants with hearing aids. It’s made for people with partial hearing loss who can hear low-frequency sounds but not high frequencies. If you have a partial hearing loss, you can probably hear fine in a quiet environment when speaking to one person but have problems following a conversation in a noisy environment. You may wear hearing aids but find that they just make noise louder. Men’s voices may be easier to understand than women’s. EAS can help you to regain hearing in both the low and high frequencies of sound. This is an example of an audiogram indicating how your hearing might improve with EAS. 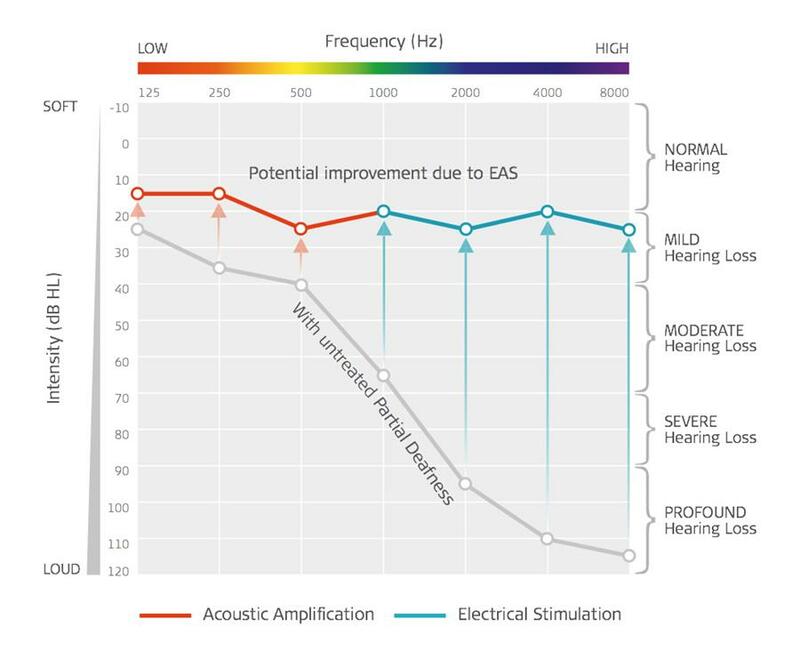 The red line shows how acoustic amplification can improve your residual hearing in the low frequencies, and the blue shows the significant improvements in high-frequency hearing that electric stimulation provides. Together, these technologies combine and can help you to hear all the sounds of speech. How does an electric acoustic stimulation system work? The cochlear implant component stimulates the part of your cochlea that’s responsible for high-frequency sounds, while the digital acoustic component takes advantage of your natural residual hearing by turning up the volume on the low-frequency sounds. Together, it covers the full hearing range. As with a cochlear implant, a small audio processor is worn behind your ear. It is connected with a cable to a transmitter coil, which sits on the outside of your head, over the implant. The coil stays in position with the help of magnets. During the operation, a flexible electrode is inserted into the cochlea in your inner ear. However, unlike a conventional cochlear implant, which covers most of the length of the cochlea, the shorter EAS electrode only covers the basal region, the part that’s responsible for high-frequency sounds, leaving the still-functioning apical region untouched. A microphone inside the audio processor picks up sound waves. Both high and low frequency sounds are processed simultaneously. Low-frequency tones are amplified and sent through the ear mould into your ear canal. These low tones take the natural path to your cochlea, where hair cells in the apical region, which deals with low-frequency tones, receive the amplified sound signals. At the same time, the audio processor digitally analyses and codes the high-frequency tones into a special pattern of coded electrical signals. These signals are sent to the coil and transmitted through your skin to the implant. The implant creates electrical pulses from the coded signals. These pulses are relayed to the relevant electrode contacts inside the cochlea. The hearing nerve receives both acoustic and electric sound information at the same time and transfers it to your auditory cortex, the hearing part of your brain, where it is interpreted as sound. Can you get it on the NHS? The same NICE guidance for cochlear implants applies to EAS systems. Read the NICE guidance here. A thorough assessment will be carried out to determine suitability, as with cochlear implants. Who is an electric acoustic stimulation system suitable for? A partial sensorineural hearing loss. This is classed as mild to moderate hearing loss in the low frequencies and severe to profound hearing loss in the high frequencies. A word recognition test score of 60 per cent or less at 65 dB in the best-aided conditions. There must be no progressive hearing loss – if your hearing loss is gradually getting worse, the EAS system may no longer work well for you within a few years as a degree of natural residual hearing is essential. There must be no abnormalities or obstructions of the cochlea. Better understanding of speech – Research shows that EAS system users scored 50% better in speech understanding and sound quality than they did with hearing aids before the surgery. Improved speech, as users are able to hear their own voice more clearly. Using the telephone is easier due to improved speech recognition. Participation in school and work environments is easier. Ability to hear at higher frequencies means it’s easier to appreciate music. Improved quality of life – Better hearing makes socialising in groups and environments with background noise easier. It involves an operation using a general anaesthetic. A large 2013 UK study shows that the risk of major complications is small – around 1.6% – and most complications are minor and temporary. Ask your surgeon to explain how the risks and benefits apply to you. The benefits aren’t instant – you need to follow a rehabilitation programme afterwards to teach your brain to hear the high frequencies again, using the cochlear implant. Again, ask your doctor and a mentor for more details. The device is more conspicuous than a normal hearing aid. Electrode softness and flexibility – The softer and more flexible the electrode, the more ‘atraumatic’ it is. This means there’s a low risk that it will cause trauma, or damage, to the delicate structure of your inner ear, helping to protect your residual hearing. This is especially vital with EAS as your residual hearing is in the lower tones is taken advantage of. Compatibility with future sound-coding strategies – This means it’s possible to upgrade your internal implant without surgery as future advances in technology are made. Backwards compatibility – If an audio processor is ‘backwards compatible’, that means it will be compatible with an implant that you may have had for several years. Intelligent sound adaptation – Your audio processor detects when you change environments and adjusts programs and volume automatically, so you don’t have to keep making manual adjustments. More than one microphone – This sharpens the sounds in front of you for better hearing in noisy settings. Reduction of wind noise so it’s easier to hear outdoors. Water-resistance, so your device is splash-proof, or offers waterproof accessories so you can swim wearing your audio processor. MRI compatibility – It’s important to know whether your device is compatible with MRI scanners used for diagnostic medical tests, and to what degree. to find out more about what it’s like to use an EAS system every day. The contents of this website are for informational and educational purposes only and do not constitute medical advice. This website should not be used to diagnose or treat health conditions. You should contact a healthcare provider if you have healthcare related questions.